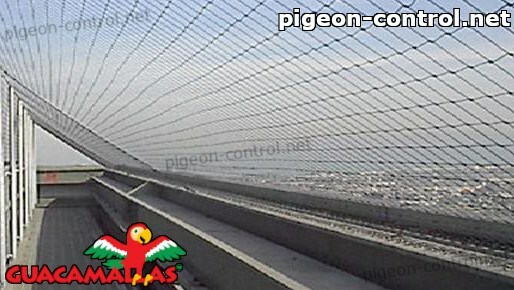 Pigeon Netting has been primarily used for the purpose of keeping birds away from a particular area. For this reason, it is often seen on the outside of buildings, particularly in cities, to discourage pigeons from roosting, and is obviously where the netting gets its name from. It has also been used by growers to keep birds from landing on or harming plants or seeds. However, there are also a number of different uses for this type of netting which are geared specifically towards the need to train plants to grow in a particular direction, and thereby increasing the amount of harvest seen. Bird net is a great substitute for what is known as scrog net. Some growers may have heard of this term before, and may only recognize it as a type of growing technique. The name actually is an abbreviation for the name screen of green which is placed above growing plants to aid in the growth process. This method of growing is designed to help bring all levels of the plant to the higher level of the upper canopy to improve the plant’s access to light, and thereby seeing an improvement in growth. 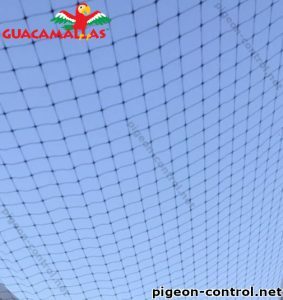 The pigeon net is used to keep pigeons away from a selected area. Throughout time, growers have looked for ways to improve their crop yields. The use of netting is one of these common ways to help train a plant to grow in the best way possible to produce a higher yield. This helps the plants to grow as efficiently as possible. The result is a plant that is bushier and produces a higher yield. The process of scrogging uses netting that is placed above the plants. As the top of the plant reaches the height of the screen, it is then tied to the screen to encourage it to grow outward instead of upward. When this process is combined with topping, there is even a higher harvest experienced. This process involves simply cutting the tops of the plant off at strategic locations so that it continues to grow outward on the netting instead of upward. These two methods make it possible for the plant to have more access to light and make the growing process much more efficient. The process of scrutiny causes the plant to grow and have more access to light. One of the largest benefits of training plants with pigeon netting is that it helps to improve the access to light that plant gets. Because the leaves of the plant are what absorb the most light, when they are grown in a single layer at the same height, the light is able to be absorbed efficiently, and allows the plant to grow much more efficiently, as it is not wasting energy. Similarly, it helps to ensure the yield from each plant which is comparable to that of the other plants being grown at the same time. This is because plants are all trained to grow at the same canopy level and will not overshadow another plant. Not to mention, since any short branches are trimmed so that they do not produce anything that is less than ideal, and all of the plant’s energy is able to be focused on producing the highest quality yield possible. The mesh of pigeons is a good option since it also works for plants and gives them better access to light. The use of scrog may appear to be more time consuming for the grower to use, but there are a number of instances when the time required significantly outweighs the time needed. This process is ideal for growers who are looking to have a higher yield but have limited space. Because the plants have the potential to increase their yield by 20%, there is less need for more plants to be planted, as well as less space needed to grow the plants. It is also ideal for use with plants that are known for growing fairly large. The use of the net helps to spread the growth out in a smaller space while not hurting the yield, not to mention it helps to prevent growth from going down to the ground, where it will receive limited access to light. For specific types of plants, like indica and sativa strains, where there are regulations on the number of plants permitted to be grown by a gardener, this is even more important. This process is also great for use indoors, which some growers have found to be an ideal setting for a number of different plants they may be seeking to grow. The advantage of the network is that it helps extend the growth of the plant in a small space and prevents the plant from falling to the ground. 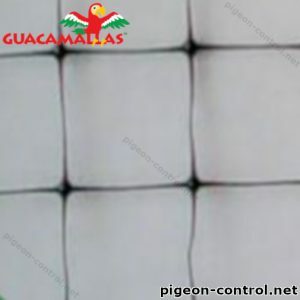 Because pigeon netting is affordable, and is easy to adjust to the needs of the growing area, it makes it an ideal choice for those looking to use this method of growing. To use this method, the grower simply allows the plant to grow a few inches above the screen before redirecting branches so they grow at a single height of the screen. This creates the ideal canopy for the branches, leaves, and buds on the plant to get the right amount of light. In this process, the grower will also cut off small branches and side shoots which will only waste energy and will not produce anything come harvest. One word of caution though with this type of growing is if deciding to tuck the growth into the screen instead of typing it into place, it should be done with great caution so as not to accidentally cause damage to the plant. Another advantage of the pigeon network is easy to install and adjust to the needs of the selected crop area. The use of bird netting clearly goes far beyond the use of trying to keep birds from getting access to valuable crops. 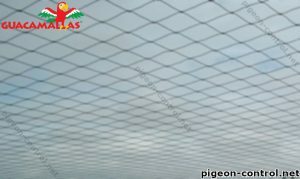 Pigeon Netting is particularly useful for training plants to grow in a particular direction, and help to improve the overall crop yield. One of the most commonly developed uses of netting in growing and training crops, is by using it as a SCROG net for specific types of plants. It is ideal for use with hemp and particularly good for use with sativa strains. It is estimated that the use of this type of netting can help to increase a harvest by 20% when used properly. This is something which is well worth the cost and effort for any grower. Spring and autumn are the peak seasons of pigeons’ breeding. They find shelters in slopes, shelves and open blocks of walls for their nesting. These birds have the ability to steal from crops very easily and quickly. Particularly at small orchards, the damage of agricultural products is at a significant level. This damage is not ignorable and can easily be detected as it follows specific trends or patterns and usually increases at the time of crops maturation. Generally throughout the year and particularly in the mentioned seasons, they become a source of great irritation for the homeowners and those who are associated with farming or agricultural business either at small or large scale. Proper techniques for pigeon control are required to make the slots or places inhospitable for pigeons where they tend to make nests. Pigeons mostly depend on humans for their feed. They prefer to live near agricultural or green areas, warehouses of factories and grain production units. 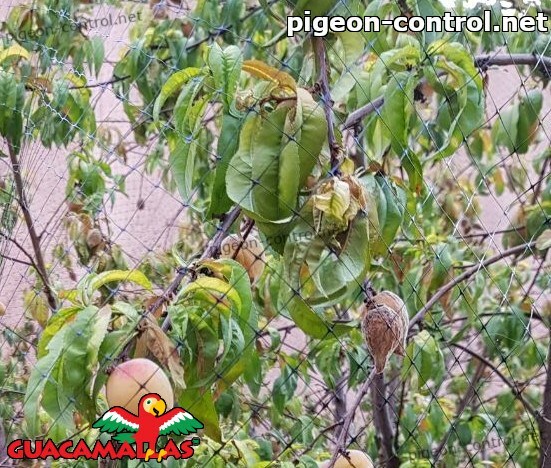 Apart from any proper techniques, just avoiding pigeon feeding can also prove to be useful in getting rid of these uninvited guests and save your personal properties, farms and crops. The most common places that pigeons prefer to live are in green areas, warehouses and grain factories. Netting is an actually operative and successful technique. 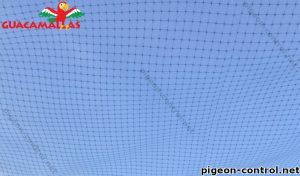 Most of the times, a net which is available in different material types and sizes is fixed directly over the crops to block the approach of pigeons. When crops are cultivated over large area of land, this method can be expensive but it is considered as a one-time investment. This is because the net once purchased, has long life. Once it is applied over the agricultural land, it can be reapplied for a number of times. A subtype of netting is live pigeon traps. These traps catch pigeons without causing any harm to them. Like rat traps, pigeons and birds are attracted towards food items, grains or corns, which are placed inside the ploy. They enter the traps from one side and see other pigeons already there and the entrance is closed afterwards. 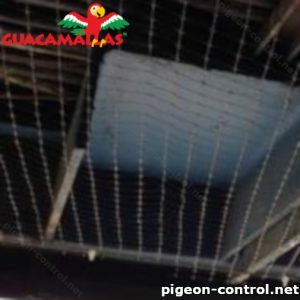 Pigeon spikes and wires are used as a cost effective technique of pigeon control. These spikes and wires are placed at balcony or slopes outside windows. Taking away all sorts of food and water sources from the places where pigeons are comfortable to roost or make their nests can also decrease the birds’ interest. In case of agricultural land, drop showers and fertilizer feeders are used instead of direct supply to crops. It is another chemical mixed birds’ attractive product. Pigeons get hooked up with it quite easily. It is considered as a cheaper technique as compared to netting and spiking. Gel liquids, that are either hot or slippery are also applied at land surfaces and areas which are birds’ friendly. These fluids do not harm the birds. This is a temporary and messy remedy for pigeon control. The use of scaring tactics through various visual and noise making devices was common in past, but now their practice has become scarce. For this purpose plastic snakes and owls or other big birds were kept in the crops. Canons were used sometimes to make explosions and frighten birds. The reason of unsuccessful reputation of these tactics is that, pigeons and other birds become familiar with these and with the passage of time they do not get scared of these things. Electrified devices give a light dose of voltage to pigeons, making them annoyed and disturbed at once and they leave their place immediately. These devices sometimes include spikes and different sort of wires as well. 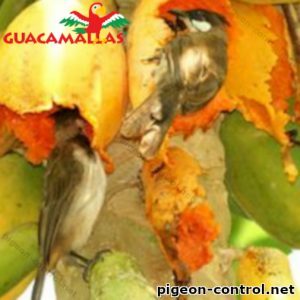 Chemical sprays and repellents are also used at small fruits and crops which temporarily change the smell and taste of grains or fruits and prevent pigeons from taking those. Methyl Anthranilate, Methiocarb and Mesuorol are the registered and commonly used chemicals for this purpose. These chemicals are somehow not considered good for human health as well. These techniques are adapted rarely for pigeon control. These include getting rid of pigeons and birds through shooting and killing. Legal procedure is also involved to take permission for such activities. Placing dead pigeons at places where pigeon control is necessary can also be useful. According to a study, birds also do funerals in their own way. They warn and alert other birds about nearby dangers. The hail network is one of many methods to protect crops. Apart from these techniques, crops are guarded and grown through high-wires and nets. Even some of the agricultural crops such as tomato and cucumber are known as high wired crops. This high wire technique assures large production of crops and also save them from pigeons and other birds. However it changes the production pattern in many ways. A high wire crop also has high productivity and growth rate. Hail netting is a bit similar to it, and is one of the oldest and widely used methods for crops’ protection. Thunderstorms, hailing, heavy rain and other natural calamities cause fatal damage to crops. Hail netting includes nets which are usually thick in density and protected with woven, UV polyethylene, or canopy (non-stretchable) coating. The advantages of hail nets without their density is very thick and that they are protected with UV polyethylene. Pigeon control is crucial also because these birds are messy creature. They carry injurious viruses with them. Presence of pigeons leads to the birth and growth of pests like ticks, lice and louses. Avoiding pigeon control can impair human life by causing many harmful diseases. One of such diseases is a sort of fungal infection known as Histoplasmosis. It is caused when human body inhales such virus with dust containing pigeon dropping. Another disease is Cryptococcosis which is rarely found, but individuals suffer from immune system infections due to this. In addition to these two, Psittacosis is another transferable infection. It is shifted from pigeons to other birds, such as parrots and also to the human beings. The nest of pigeon is home to a number of bugs. When thrown somewhere or abandoned, these bugs spread all around. Wiping out the places that were host to pigeons with anti-bacterial sprays and chemicals can decrease the toxic effects of the presence of such bugs. 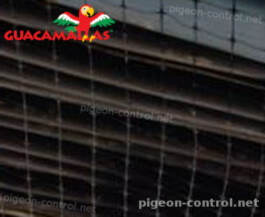 Pigeon control is a term that sums all techniques of deterring or even getting rid of pigeons when they represent a problem. It is used by farmers, mayors or others in need when their house or garden is damaged by birds. The most affected people are those living on farms, where pigeons find plenty of food in the garden, near the animals or trees. Another place ruined by pigeons are big cities where there is a lot of food waste in the garbage. In parks, many people feed them. Why control their number? They destroy the aesthetics of a building, by making a lot of mess on the roofs of the houses, the parks become dirty and spread bacteria and fungus. A few of the diseases spread by pigeons are Cryptococcal Meningitis, Salmonella and Listeria, Viral Encephalitis and E. Coli. 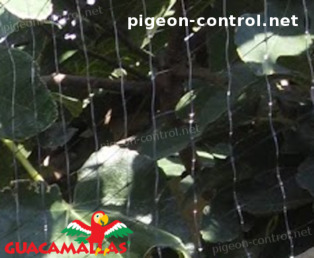 The bird netting for pigeon control is a resistant and durable protection for avoid the damage for your crops. Pigeons are cute little birds in the parks and near old buildings. But sometimes they are not so pleasant. The situation becomes even worse when pigeons decide to taste your lettuce, your fruits and they are delighted. Their number will grow each day. In some cases, it may happen that 150-200 birds appear in your garden. Before this happens, you should decide to do something and search for pigeon control options. 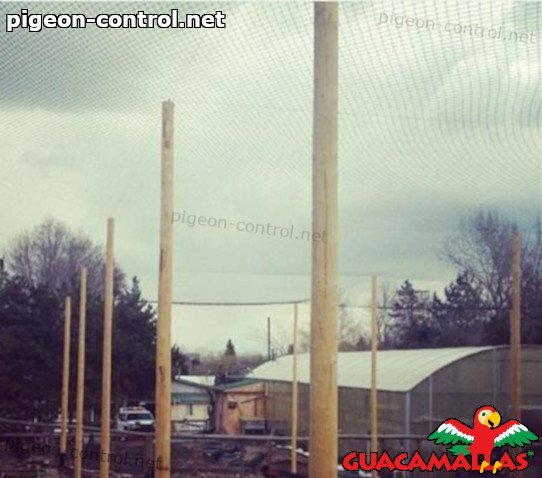 You have pigeon spikes, pigeon control netting, bird netting, pigeon wire, bird-scaring devices at your disposal. If you cannot decide what method to use, let us present you the most effective methods. There is nothing more annoying than finding out that you have no apples on the tree. That could be the moment you realize you have to buy a pigeon control netting. Bird netting and bird wires do not kill pigeons. This is only most effective way to keep them out. 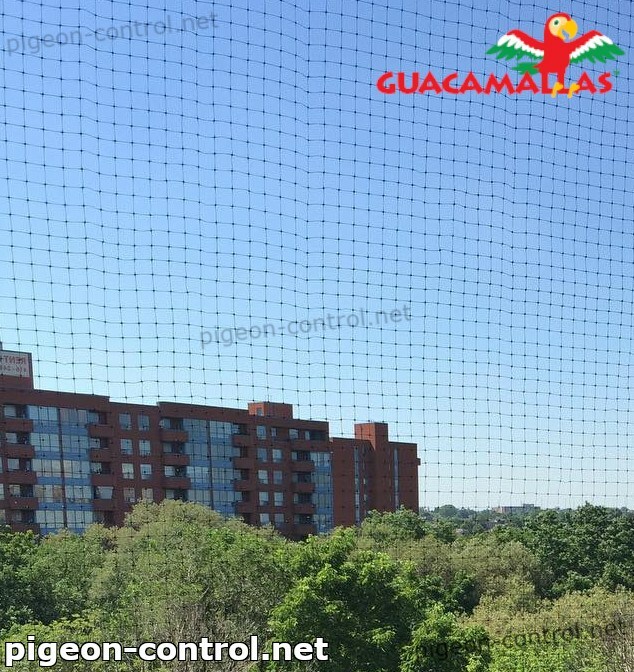 With bird netting, you can protect your crops from pigeons, buildings from the mess and even yourself from diseases. 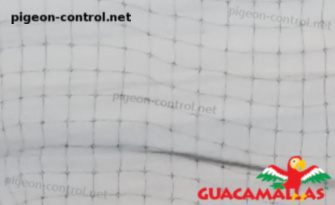 For pigeons is recommended to use an UV-resistant net with ¾-inch squares. You can buy electrified tracking too. With this tool, you can be sure you get rid of pigeons. They hate that generous dose of electricity, even if it is non-lethal. The bird net provide to your garden the best protection avoiding that the birds cause damage to your crops. They are used in large areas, like vineyards, airports or other open areas. In vineyards, you can use bird netting for tree protection as well. The digital sound prevents the habituation of the birds and the net stops them from getting close to the trees. It is not effective for years because, after a few months, birds get used to that sound. It has the advantage that is not harmful to the pigeons. If you notice that pigeons enjoy the food you give to small birds, you need to stop feeding them. You can try to feed again after four weeks, but, because pigeons do not give up so easily, you may have surprise visitors, again. Feeding birds always become a problem since birds remember where to return for the food. Once they got used in some place, they will always come back. If that happens, you will have to stop feeding them for a longer period of time. However, if you do not want to stop feeding smaller birds but you need to get rid of the pigeons, the perfect solution is to engage a device that helps with pigeon control. 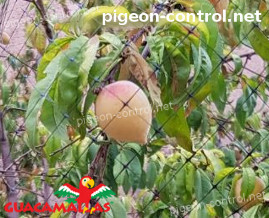 The pigeon control is a ideal method for protection to your crops for avoid that the birds cause damage to your crops. Because we live in a modern world, you can find many modern techniques too. One of them is the application of chemical solutions. This method works like the birth control pill for people. It usually mixes with food and as pigeons love any type of food they will eat it. Some chemical solutions help with birth control. This is an excellent pigeon control method because it does not harm the birds. There are a lot of pigeons living in the cities because humans feed them. One estimation says that worldwide there are 400 million pigeons. Only in New York live around 1 million birds. In many cities, the council decided to keep them in a special place where they can live and still be controlled. One method is to replace the eggs with dummy eggs. Another pigeon control method is to educate the public by campaigns, posters, and leaflets. The buildings give excellent space for roosting, and our waste and crops offer plenty of food to eat. If we try to think with a pigeon’s mind, living in town is a great idea. There is plenty of food and water and they can easily find a place to rest too. There are many window ledges, rooftops, warehouses or bridges, just waiting for them to nest, roost or shelter there. With the pigeon control you can avoid losses cause by the birds. Secure your garbage cans. Protect the garden with netting. If you have animals, you should use drop feeders. Remove water sources. They can fly far away for food or water. If they do not find these at your house, they will leave your propriety. If you usually leave your chicken water outside during the day, you have two options. The first and recommended one is to buy poultry netting and cover the area to stop pigeons getting to the water or remove any water source and you give water to your chicken only when you are there. If you find a pigeon nest, clean the area. Wear gloves and use disinfectant solution in that area to kill mites. 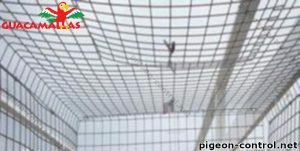 The poultry netting can be use for protect your poultries and avoid that the birds invade your farm. When pigeons are making your life difficult, you have to use some pigeon control technique. Is important to solve the problem, because your family’s food is contaminated or destroyed, your house is a total mess and most importantly you can get sick because of them. 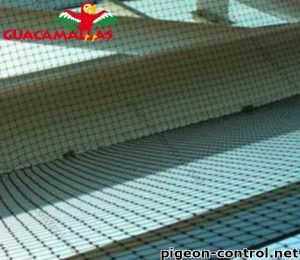 It is much easier to buy a pigeon control netting than to clean after the birds and pay for expensive medical treatments.